Ever been stuck somewhere and said to yourself... "Man I wish I had a grill right now"! But, of course, there is no grill in sight. Well you never have to worry about that again! 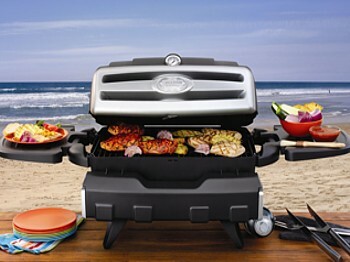 Check out the Freedom Grill � FG-50. Who says all grills have to be big and on your patio? This is the ultimate "go everywhere" grill! Perfect for tailgating and camping! 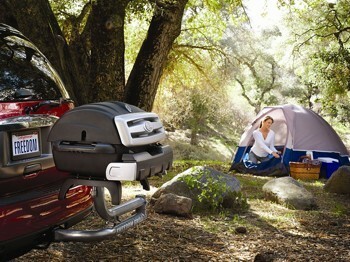 The thing we love most about this grill is you can take it with you anywhere you go! You can actually have a grill with you and ready to go at the drop of a hat! Hell... you can sell your house! You don't even need a backyard anymore!! Click "Read More" for more pics and specs! - 352-square inch cooking area. - Fold down condiment tray. - 180-degree swing-out arm with transport lock. - Accepts 1lb. or 20lb. propane tank (tank &adapter sold separately).